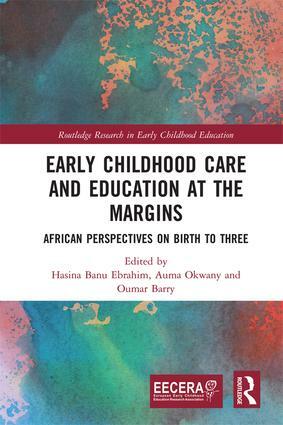 The book isan entry point to knowledge production for birth to three in Africa and responds to the call for the field to be in dialogue with different perspectives that attempt to map concepts, debates and contemporary concerns. In this book, a group of African authors, representing both Anglophone and Francophone Africa, provide insider's perspectives on a wide range of geographic, cultural and thematic positions. In so doing, they show the breadth and depth of ideas on which the ECCE field draws. The chapters in the volume highlight a range of topics including poverty, early socialisation, local care practices, gendered roles, and service provision. They open up important points of departure for thinking about ECCE policy, practice, theory and research. Hasina Banu Ebrahim is a full professor in Early Childhood Education at the University of South Africa. Auma Okwany is an assistant professor of Social Policy at the International Institute of Social Studies of Erasmus University Rotterdam, Netherlands. Oumar Barry is an assistant professor at Cheikh Anta Diop University of Dakar, Senegal. Written in association with the European Early Childhood Education Research Association (EECERA), titles in this series will reflect the latest developments and most current research in early childhood education on a global level. Feeding into and supporting the further development of the discipline as an exciting and urgent field of research and high academic endeavour, the series carries a particular focus on knowledge creation and reflection, which has huge relevance and topicality for those at the front line of decision making and professional practice in early years services.